Welcome to the first installment of our ongoing series on sausages of the world! In each post, we'll learn about the history and cooking of a particular type of sausage, enjoyed by our meat-loving brethren in some corner of the globe. For this first outing, we're focusing on boerewors, a traditional South African sausage that's also eaten in Zimbabwe and other parts of Africa. 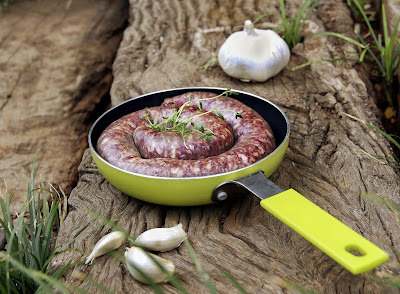 Traditional boerewors is stuffed and presented in a long coil shape. If you're like us, your first question probably involves the boerewors pronunciation. It's easy: Just say "BOO-ruh-vorse." 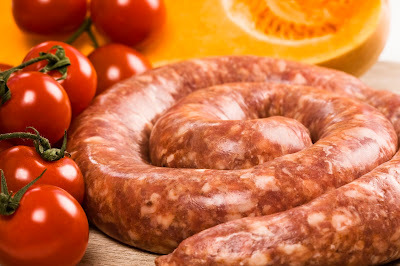 Boerewors is an Afrikaans word that literally means "farmer's sausage." As with most South African cuisine (and the Afrikaans language), the flavors and ingredients in boerewors were influenced by centuries of colonization and immigration. In the mid-17th century, two members of the Dutch East India Company were shipwrecked for several months at what would become the Cape Colony, later known as the Republic of South Africa. When they finally returned to the Netherlands, these sailors recommended the area as a kind of warehouse where East India Company ships could restock their provisions. The Cape's unique location and ensuing political struggles over the next few hundred years led to South Africa's unfortunate history of extreme segregation and racism. The country still suffers from widespread poverty and the lingering effects of apartheid, but its highly diverse population and turbulent history have led to one of the most interesting national cuisines in the world. Boerewors is partially derived from a traditional Dutch sausage called verse worst. The flavor of boerewors is somewhat different, though, due to variations in spices. It is cooked by braaing, or grilling outdoors. The Sausage Maker does not recommend using a log as a heat source. Officially, boerewors contains at least 90 percent meat and not more than 30 percent fat. The majority of the meat used is beef, with some lamb and/or pork mixed in. Traditional seasonings include dark vinegar as well as coriander, black pepper, nutmeg, cloves and salt, making for a deep, rich sausage that reminds us of the flavors of the holidays (for a slight variation on these seasonings, try our Farmer's Pork Sausage blend). Boerewors is often served with pap, a grits-like porridge made with maize. Some people prefer their sausage in a boerie roll, a South African-style hot dog with tomatoes and relish. Your exact measurements will depend on the amount of sausage you plan to make, but we've approximated the proportions you'll need for an authentic-tasting boerewors. 1. Cube your meat and fat to prepare them for the grinder. 2. Mix all spices together and sprinkle them over the cubed meat/fat, being sure to incorporate them fully for an even flavor. 3. Run your spiced meat/fat mixture through the grinder. Don't pack it too tightly! 4. Add the malt vinegar and stir thoroughly. 5. Add the mixture to your sausage stuffer and feed it into your natural casings in one long, evenly stuffed coil. 6. For authenticity, cook and serve the boerewors in this coil shape rather than twisting the sausage into links or making several small sausages (unless you're serving boerie rolls). Enjoy! Do you have a favorite boerewors recipe? Share it with us in the comments or on our Facebook page!